Sometimes you come across a dish that is so pretty and so appealing that you just have to make it. This was one of those times. I came across this spanakopita pie on the Steven and Chris website and it was just too beautiful not to attempt. Of course, it would have been helpful if I had planned a little better and, you know, actually bought all the groceries needed. But hey, necessity is the mother of invention, and I think my modified version turned out really well! Just one note - I didn't find that 1 hr at 350F was enough to get the phyllo truly cooked, so I'd up the temperature to 375F (just use foil on top to keep the top from browning too much). You can see my pastry is a bit anemic here - I think an increase of temperature would do the trick for sure! This recipe is great because it's an all-in-one dinner and looks so pretty. Mine didn't stay together quite as well as I would have liked, but I think that too would be rectified by both longer baking and longer resting, so I've adjusted the instructions accordingly. This is a bit labour-intensive - even with having the chicken pre-cooked, and the rice pre-cooked, it took about 45 minutes to put together, and then an hour to bake. So learn from my fail and don't try this on a weeknight. :p Otherwise you may or may not have to feed your hangry kids grilled cheese while the delicious dinner (which they then won't eat) ends up eaten only by you. Did I mention this serves like 10 people? omnomnom, indeed. 2. Oil a 9 inch (23 cm) spring form pan with oil and set aside. 3. Place cooked rice into a large mixing bowl. Cut chicken into small bite size pieces and add to rice. 4. Grate zucchini and chop red pepper. Add them, along with feta, cheddar, dill, parsley, shallot and garlic, to the chicken and rice. Stir together. 5. In a small bowl, whisk together the 3 eggs with the salt and pepper. Add eggs into bowl with rice mixture. Mix ingredients together until evenly combined. Set aside. 6. 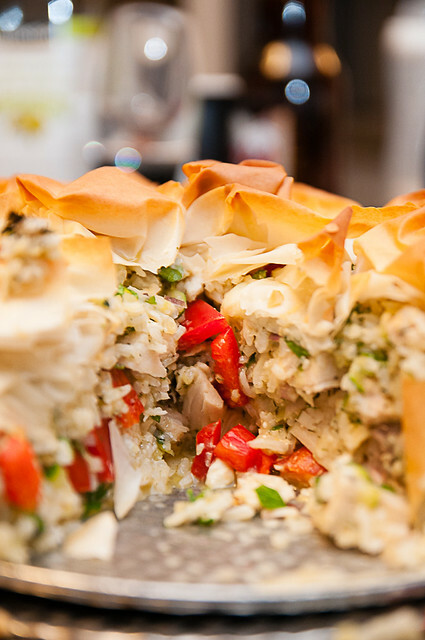 Lay the thawed phyllo out onto a clean surface. Lightly brush one sheet with oil, on one side only. 8. Before filling the pie, lift the overhanging edges and fold them into the pan, all around, so that you are creating a layered pastry lined wall of the pie. Press the pastry firmly into the sides of the pan to give the shell structure. 9. 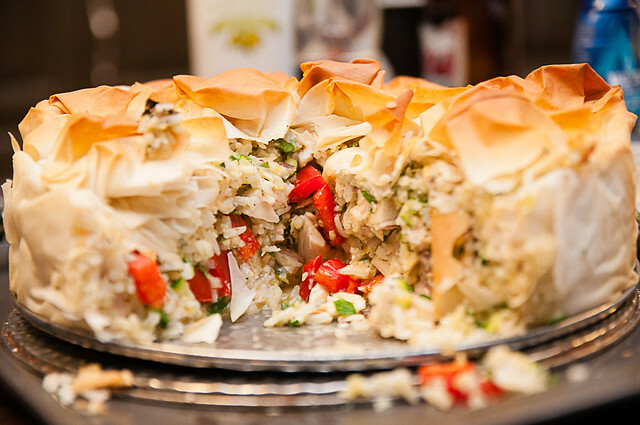 Turn rice and chicken mixture into pie shell. Brush the remaining phyllo, one sheet at a time, with oil. Rip (or cut) each sheet into 4 pieces and gently crumple the pieces into a very loose ball. 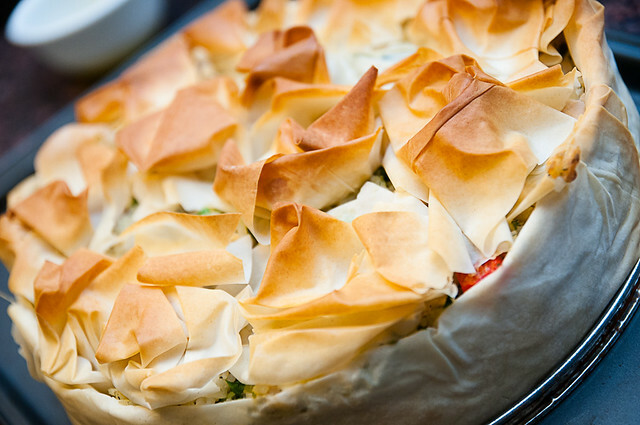 One by one, place the scrunched phyllo balls on top of the filling to cover the whole pie. Lightly brush the top with the remaining oil. Place a piece of foil over the pan. 10. Bake for 45 minutes. Remove foil and bake for 15 minutes more, or until the top is golden. Remove to a rack to cool slightly before releasing spring form ring. Serve in a platter. Use a sharp knife to cut into wedges. I just loved how this looked in the pan, and the taste was great too! I'm not sure I've seen gf Phyllo, but I bet you could substitute your fave gf crust for the bottom and emulate the crunchiness with crushed gf crackers (or even kale chips).